The world's top paddling news in week 25, 2018. Palm Blogs - Here are a few tips on planning a trip to the Zambezi – we found it difficult to find information on kayaking there independently – so here’s what I discovered last August. Jackson Kayak - Over Memorial day weekend, my family made one of the best decisions ever. We decided to go to surf Buseater. I had come home from school, and my mom told me that Minibus was in, so we packed up and set for the land of Canadia. SUP Connect - Shore to be a good time. The Santa Monica Pier is officially putting summer on notice with the announcement of the first Pier 360 Ocean Sports & Beach Festival on Saturday, June 23rd and Sunday, June 24th. kayakudos.com - If you’ve ever headed out on the water for a paddling session, you know how quickly you begin to fall into a rhythm. Maybe the beauty of nature settles your soul. Perhaps the cadenced movements of your body challenge your strength and test your endurance. Whatever the reason, you always feel great when you paddle. SUP Examiner - Ben Marcus’s book The Art of Standup Paddling trumpets that standup paddling has arrived. Until now, SUP books seem to suffer from trust issues. SUP Magazine - It's a simple concept. One-hundred twenty three teams are set to launch under their own power from Tacoma, Washington on Monday evening, June 11, bound for Port Townsend some 70 miles across Puget Sound. SUP Magazine - Sam George explains how he nearly lost vision in one eye during an old surf trip to Baja. unsponsored - For my major project at the University of Nottingham I investigated whitewater Personal Floatation Devices (PFDs) and the level of buoyancy they provide. The aim of the project was to increase the total buoyancy available to the user in emergency situations. 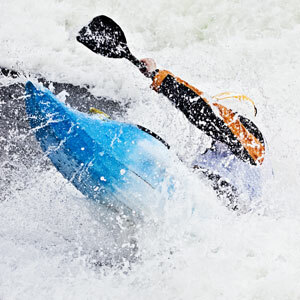 unsponsored - Over three years in development the new Jackson Kayak – Rockstar 4.0 is now available. Jackson Kayak - Over three years since we made a new Freestyle Kayak. That is the longest time in Jackson Kayak history well, the wait is over. SUP Examiner - Know about the card company American Express’s plans to spread awareness on marine and plastic pollution to its card holders, they are planning to make a card out of recovered plastic found in the oceans and on the coasts. Inspiring is it not? SUP Connect - 1.2 million people are expected to paddle board this year. With the sun shining and the summer months quickly approaching, it’s time to grab our boards and hit the water. Traversing - Here's a great idea on how to find some serenity from insects while using the Thunderbox. Site Zed - Moments before my last swim I perched my kayak atop a slanted rock. As I situated the outfitting my boat slid into the river. I slid in right behind it. Canoe Kayak - Great Lakes kayakers Joe Zellner and Peggy Gabrielson share three tips for completing a long-term self-support paddling expedition. To see all the latest headlines, videos, forum discussions and more, visit Playak News Watch. This is the standard version of the newsletter, covering all paddling disciplines. To change the tailoring, please login on Playak, and then click the yellow triangle at the very top of the page to set your interests.